So far, I’ve been all about apples this fall. Besides the two awesome recipes I’ve posted thus far, this one is a favorite: the simple and delicious baked apple chip. It all started years ago, when I bought a bag of apple chips that brought like, three in the bag. I loved them but was outraged by the fact that the bag was practically empty. As usual, I uttered an “I can probably make this myself but way better” and started planning. After I figured it out, I made so many and so often, I got sick of them. It’s been quite a minute but I decided to bring them back; for old time’s sake. 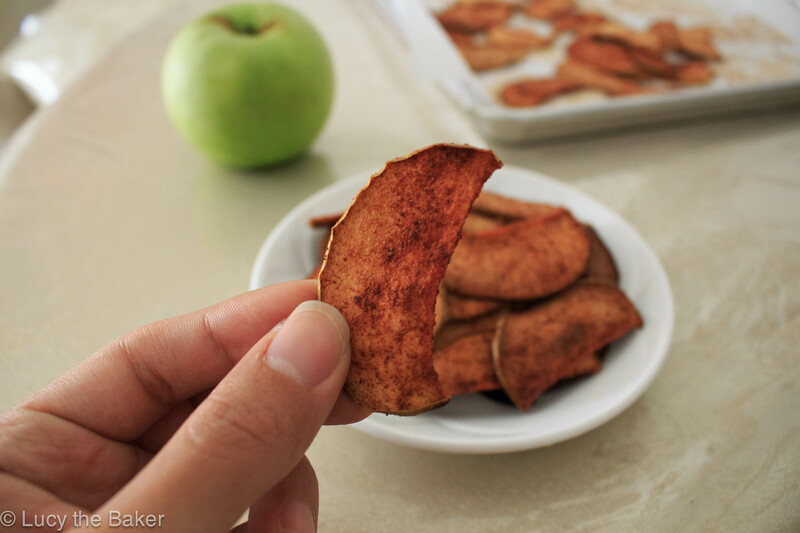 For apple chips, you don’t need many tools and they aren’t as fancy as you may think. First, you need your apples (obviously), a cutting board, and knife. You can use any apple you’d like but I’m very partial to the Granny Smith. For you lucky ducks who have a full sized mandoline, you can skip this step. I cut them so it’s easier for me to core and slice but if you have an apple corer, this is the time to use it. For those like me who don’t have a full sized mandoline, it’s time to cut the apples. I like quartering them to remove the core. That, and a quartered apple is easier to slice once cored. Now that the apple is quartered, let’s core. Place an apple quarter on one of its flat sides. Introduce the knife to the apple at an angle (like maybe 45 degrees?) and slice out the core. Sounds weird to explain it like this, so I hope the pictures helped! Once that’s done, we can move on to slicing. At this point, if you’ve got the knife skillz, you can do it by hand. I do not, so I use a hand mandoline. I call it the ‘handoline.’ Catchy, right? I love slicing with it because I get kind of uniform slices every time. I say ‘kind of’ because depending on the amount of force used when slicing, the end product can end up either too thick or thin. Speaking of which, if free handing, make sure they’re all about the same thickness. This is crucial to the apple chip’s chippyness. And for safety’s sake, use the hand guard. Yeah, I know I’m not using mine but do as I say and not as I do. SAFETY FIRST. Now that all the apples are sliced, let’s talk toppings. If you’re a purist, you can lay them out on the baking sheet and bake them as is. I’m not, so I like topping mine with cinnamon sugar. 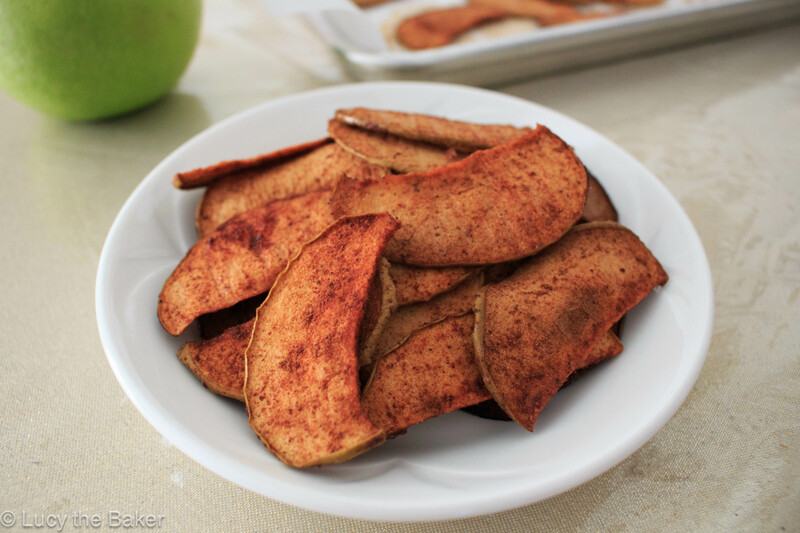 I use about two tablespoons of sugar to 1/2-1 teaspoon of ground cinnamon per apple. The amount of cinnamon varies, depending on how festive I’m feeling. You can pretty much go either way here, and top them however you like. Toss the slices in the sugar and cinnamon, making sure they’re all somewhat coated. On prepped baking sheets (prepped = lined with parchment), lay out your slices carefully. Make sure they’re as close as possible without touching. This isn’t one of those recipes where you can get away with throwing everything on the pan all haphazardly. Take the time to line them up. At this point, you should’ve had your oven preheating before you even started. For those keeping score, it’s at a whopping 250 degrees fahrenheit. I know what you’re thinking; “does my oven even go that low?” Yes it does! Believe me, I thought mine didn’t either. Now, place your apple soldiers into the oven and bake for AN HOUR AND A HALF. Why so long? Well, apple chips get their chipyness from being dehydrated in the oven. The low temperature and long bake time makes it so the dehydration is done carefully and evenly, so the apples hold their shape and are crisp when done. You really can’t crank the oven up with shorter times to speed up the process. It won’t work, and your apples will burn. Patience, grasshopper. You shall be rewarded. Midway through baking, flip the slices over and rotate the pans in the oven. Also, watch the apples as they can burn if you don’t. Believe me, I know. After that painstaking hour and a half is over, it’s time for the slices to cool. This is also crucial because out of the oven, the slices are still floppy and not very chippy. We don’t want that. Let them sit on the baking sheet for at least 10 minutes, and watch your previously floppy apple crisp with delight. The apples turn into chips that still taste very much like apples, with a slight sweetness from the sugar and a hint of spiciness from the cinnamon. They are extremely addicting, so make a lot! I’m glad I brought these back from the mental grave I dug them into. It reminded me of why I started making them (and also why I stopped). I can’t hate them though; they are the perfect snack. Preheat the oven to 250F. Line two baking sheets with parchment paper and set aside. On a cutting board, quarter and core the apples. 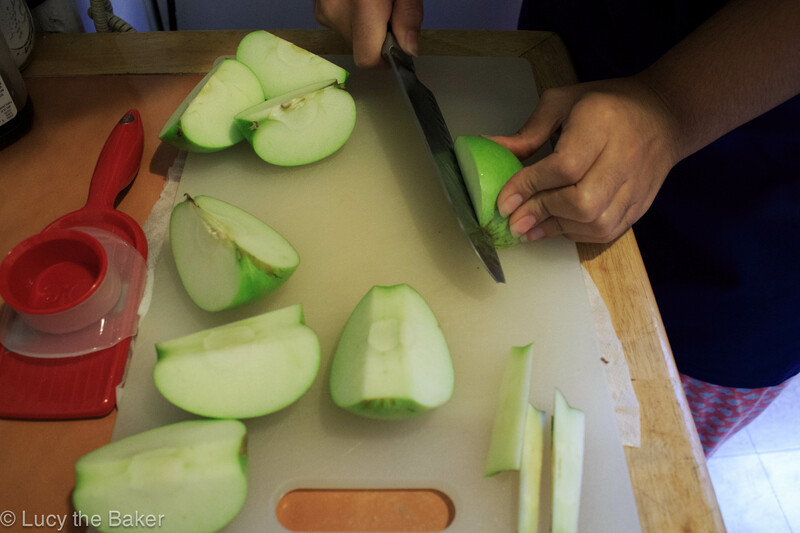 If you have a full sized mandoline, feel free to core the apples (with a corer) before slicing. Or, you can slice them without coring. Once quartered and cored, begin slicing the apples. You may do so with a knife or with a hand mandoline (handoline!). 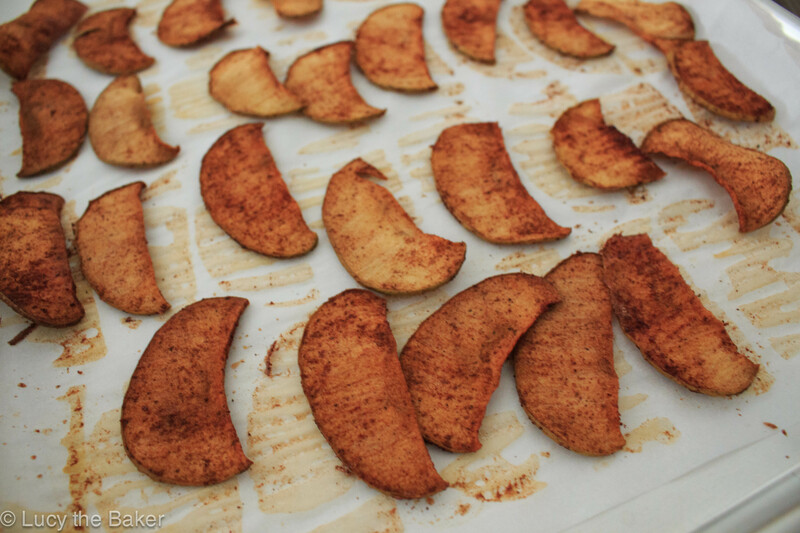 Place the apple slices in a large bowl and sprinkle the cinnamon sugar. Gently toss the apples to evenly coat. Carefully place the apple slices on the prepped baking sheets as close as possible without touching. Bake the apple slices for an hour and a half, flipping the slices over and rotating the pans halfway through baking. The apples are done when they look a little wrinkly and are dry to the touch. Cool on a rack for at least 10 minutes before devouring. Any leftovers keep well in an airtight container for a couple of days. First things first, you need a sponge. This is the starter for the bagels, which is a combo of 1 teaspoon instant yeast, 4 cups of bread flour, and 2 1/2 cups of room temperature water. Stir the ingredients together until homogenous and kinda looks like pancake batter. Cover and let rise at room temp for two hours. The first time I made these (yes, I made them twice), I started the sponge and went out to see a movie. I am totally serious, too. The movie was fantastic, as was my sponge when I got home. Technically, you’re supposed to let it rise for two hours but mine did fine with more than that. Honestly, I thought I was gonna come home and find my house overtaken by the sponge! It really was fine, and I got to work soon after. Now, it’s dough time. Nothing out of the ordinary here; more yeast (1/2 teaspoon), bread flour (3 3/4 cups), salt (2 2/4 teaspoons) and sugar (1 tablespoon). Fairly simple. Heads up though; make sure your flour is bread flour. I think that because mine was some “better for bread” flour, that may have had something to do with the finishing texture. Nothing terrible, just may not have been what I was looking for. After forming a somewhat cohesive dough ball, it’s time for the most labor intensive part of the entire recipe: the kneading. This is where a stand mixer would really come in handy because this blob needs to be kneaded for quite some time. 10 whole minutes by hand (if you’re brave). Knead the blob until it’s firm but still smooth, pliable and not sticky. If a tad dry, add small amounts of water to rehydrate the dough. Too sticky? 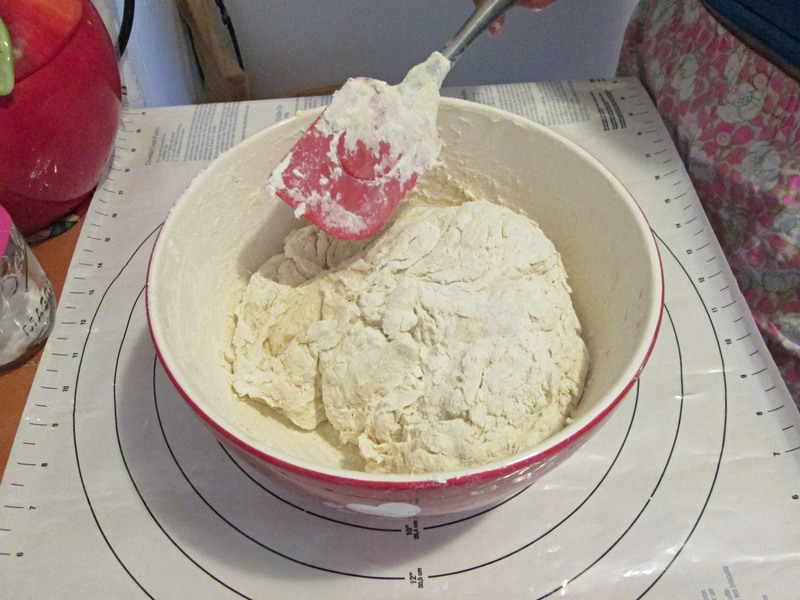 Add a bit more flour and knead until desired texture. Rule of thumb: when making doughs, you know you’re pretty much done kneading when it’s no longer sticky. The trick is to keep kneading it to that point without adding a ton of flour. Challenging, but the more you do it, the more you’ll know by feel when you need more flour versus more kneading. After kneading, break out your scale and your bench scraper because it’s portioning time! 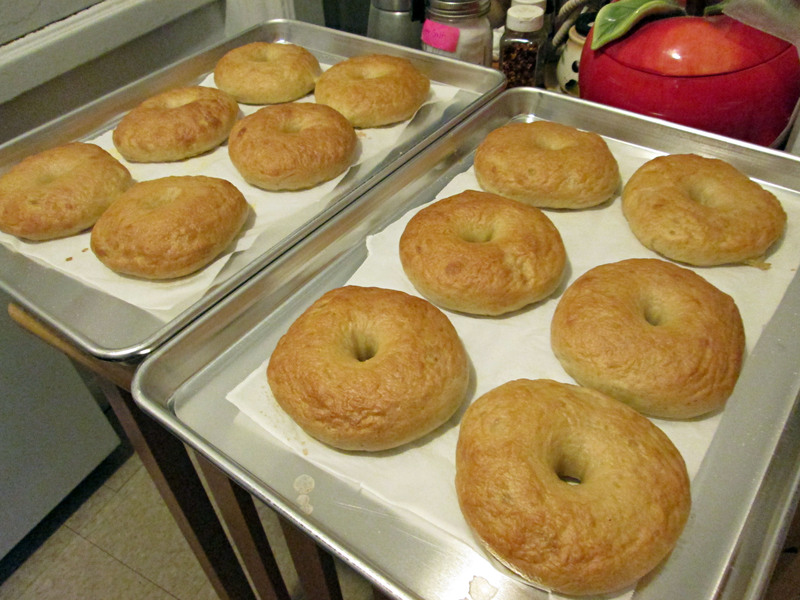 According to Deb and the recipe, standard bagels are 4.5oz., so that’s what I did. I got a dozen but please reference the recipe for different sizes/weights. Cover the dough balls with a damp towel and let them rest for 20 minutes. Take advantage of this break, as kneading that dough was no easy feat! Also, line some baking pans with parchment for later. All ready for a rest! Rested dough balls. Isn’t my kitchen towel cute? To form the dough balls into bagels, I picked up one of the rested dough balls and began making an indent in the middle, and kind of wiggling my thumb into the ball to begin making the hole. After the dough was pierced through the indent, I widened it while turning the dough to make sure it stayed pretty uniform. After forming them all, I placed them on a lined baking sheet, covered them with plastic wrap and let them rest again for another 20 minutes. I cleaned up during the wait; baking’s messy! This is where things get interesting. After the 20 minutes is up, fill a bowl with some cool/room temp water. Not cold and not hot; cool. Carefully take one of the rested bagels and plop it in the water. It should float within seconds. Got a sinker? Carefully dry off the tester, return it to the pan, cover and let rest an additional 10-20 minutes and re-test until it floats. That’s how you know it’s ready for the next step: an overnight rise in the fridge (aka retarding). The first time I made these, I did the overnight rise and my bagels came out good. The second time, I skipped the overnight rise and let them rise for about four hours. I did not note much of a difference. Is the overnight rest necessary? Probably. Does it mean you won’t have delicious bagels if you shorten the time? No. If you have the time (and fridge space), go for the overnight. If not, four hours works just fine. Carefully dry the tester bagel and return to the pan. Pop them in the fridge to rest overnight (or four hours). Now that the bagels have spent time in the fridge, it’s time to bake. Turn your oven on up to 11 (ahem, 500F), and prep a large, wide pot with some water. Bring the pot to a boil with a tablespoon of baking soda. Before baking, bagels bathe in this boiling hot solution. Why? To form that signature bagel crust. You know the one; where the bagel is all crisp on the outside but chewy and soft on the inside. I heard this is the reason why bagels only get toasted on one side (the inside part, if you were wondering). Giant pretzels go through the same process, but that’s another post. Once boiling, place as many bagels as will fit in the pot (mine fit 3) and let them sit in there for two minutes before turning them over and letting them sit in a minute longer. Remove those moist pre-bagels and place them back on the lined baking sheet that’s been sprinkled with cornmeal. This helps them not stick to the paper once wet. 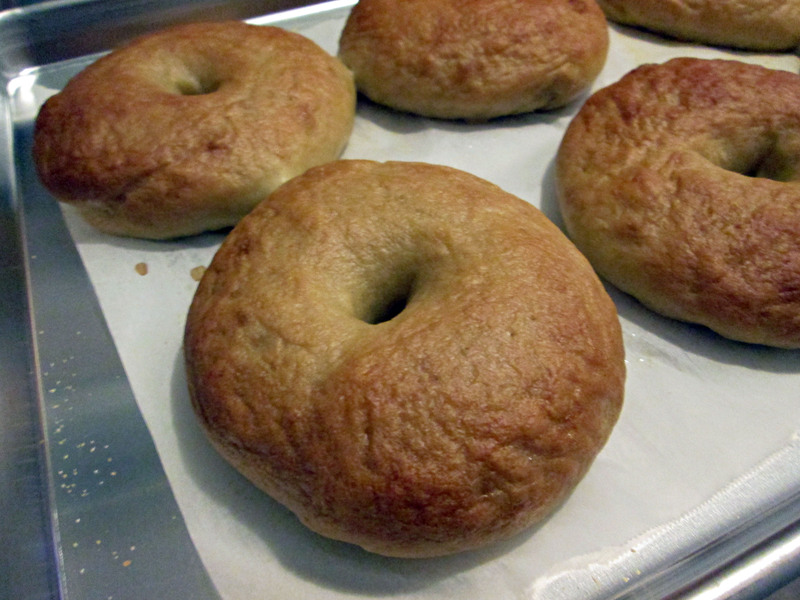 Once you’ve bathed all your pre-bagels, pop them in that scorching oven for five minutes. After that, rotate the pans (180 degrees and switch the top and bottom pans) and bake at 450F for five minutes or more. After the five minutes, check them because mine took much longer than that. I think I baked mine for 10-15 more minutes before they got all golden brown; keep an eye on them. After they get all nice and brown, cool them on the sheet on racks until cool enough to handle. That’s basically it! Not so bad, if I do say so myself. And I’m talking about the process and the bagels! They came out delicious. Although they weren’t what I was used to (AHEM, prepackaged stuff), they were pretty darn good. I’m telling you, I made them twice in two weeks! The crispy crust was definitely there (thanks baking soda bath!) and they were fluffy, and chewy in the middle like they’re supposed to be. Like a typical New Yorker, I had mine with a schmear of good old fashioned cream cheese (no lox though; maybe in the future). I have to say though, this was quite the challenge. But not challenging enough that I won’t want to tackle them again, perhaps with a different flavor and recipe. Whatever I decide to do, you’ll know. It finally looks like summer is winding down. It’s weird because it feels like this summer was short but it was still uncomfortably hot. One of my favorite things about the heat (if not the only thing) is the fact that I get to eat ice cream. I LOVE ice cream and eat it pretty much year round, but it tastes better in warm weather. I didn’t get to eat a lot of ‘real’ ice cream that much this year; except for the countless cups of froyo and this but other than that, no ‘real’ ice cream. As an adult, my ice cream palette has evolved a little bit. I still have a soft spot for cookies and cream ice cream, soft serve loaded with sprinkles from the truck, and those tiny ice cream sandwiches but I like having something with some flavor. Enter coffee ice cream. I’ve been drinking coffee since I was a kid. Blame my mom, who started giving me coffee with milk (lattes?) since I was young in an attempt to get me to eat something. My mom says that I barely ate as a kid; which I find hilariously ridiculous since I love food. One of the only ways I’d apparently eat breakfast was with a mug of coffee with milk. Now, my mom drinks espresso. Or what I think is espresso, which is known to be as coffee that is not for the faint of heart. Imagine giving a kid that stuff? I don’t recall being hyper or anything but it did give me a taste for the luscious black gold. She even tried weaning me off several times to no avail because I had gotten used to the dose of caffeine and without it, I’d get headaches. Stiffly beaten whipped cream. Perhaps too stiff? Nowadays, I take my coffee black and still get headaches if I miss my morning cup. It’s what prompted me to turn it into ice cream. Using the leftover ingredients from this dessert, I made a half batch of awesome that is still in my freezer. 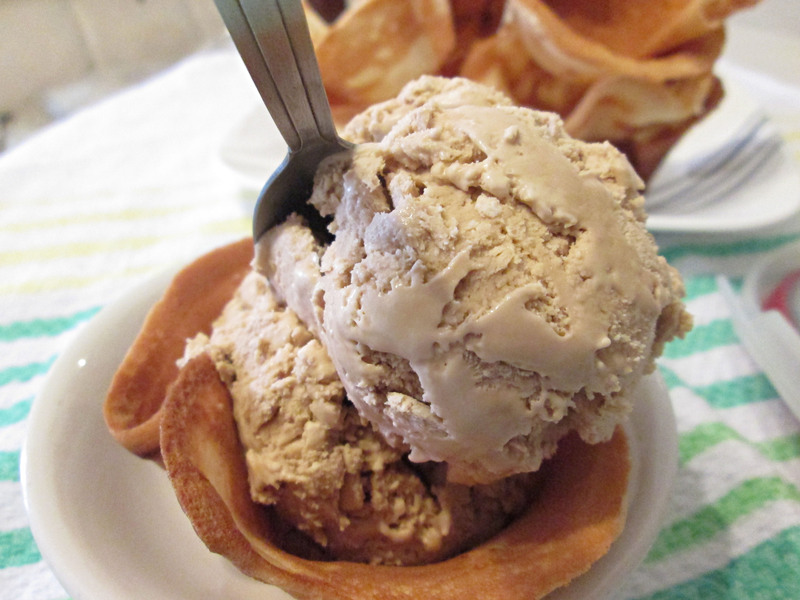 I posted about the magic of this no churn ice cream here and had been thinking about repeating the recipe ever since. 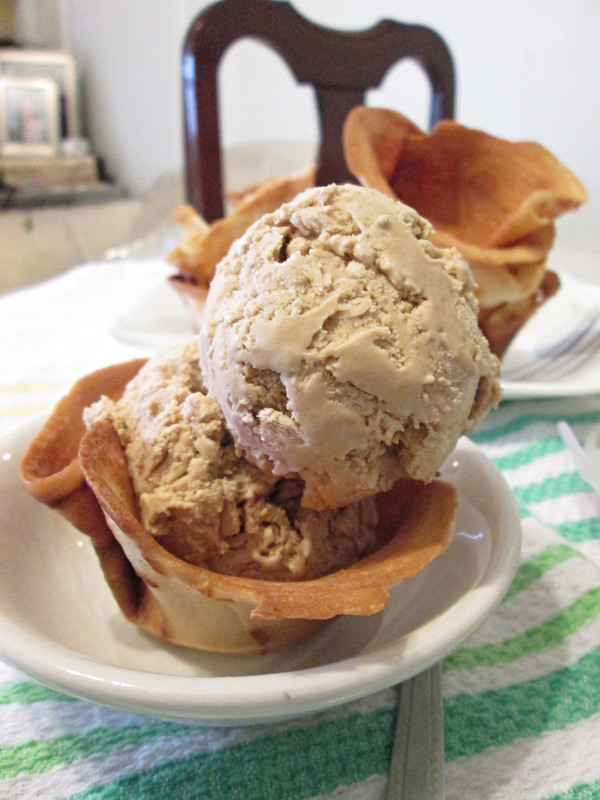 If you can whip cream, you can make this ice cream. Super simple: whipped heavy cream, sweetened condensed milk, flavorings of your choice, and an optional (ha) tablespoon of liquor. Once frozen, it’s a magical dessert that you can’t even believe it’s not traditional ice cream. 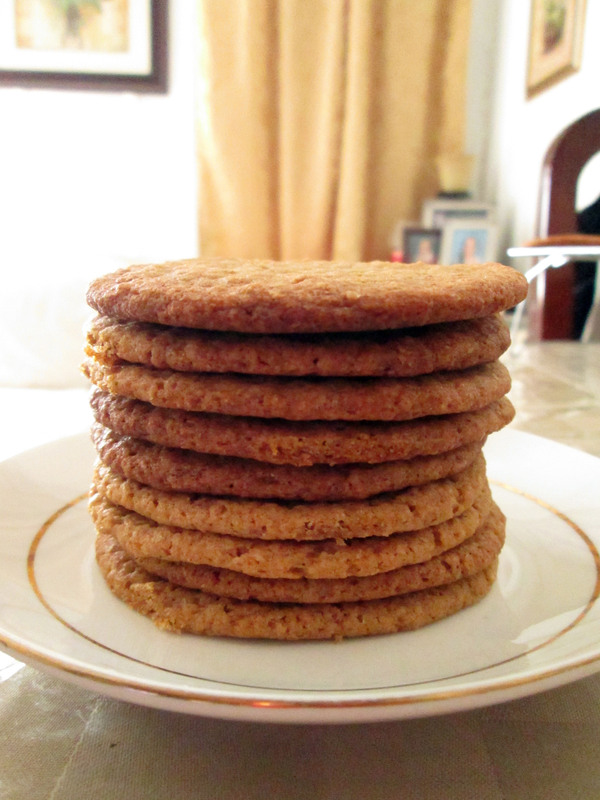 For this batch, I dissolved a tablespoon of instant coffee powder in a tablespoon of scotch. It is BEYOND delicious, with a strong coffee flavor that is still present after every spoonful. Since I have done this recipe before, I wanted to do something fun to go with it. And like most of my ideas as of late, this one came to me in the shower. Whenever I used to go to the ice cream shop, I’d get a sugar cone to go with my default cookies and cream scoop. I love the crispy and sweet taste better than I do a waffle cone. Those things taste like air. Anyway, I wanted to replicate that at home. I don’t have cone maker or waffle press, so cone cups seemed ideal. All you need is a muffin tin and a shot glass. For this recipe, you need to have patience but also work quickly, as the cones harden super fast. After the first few, I got the swing of things but was disappointed they weren’t brown enough. Either way, they came out fabulous. Despite the paleness, the flavor and signature crispness were definitely there. While my love for coffee and ice cream knows no bounds, it’s good to know that I can basically have it year round. Even if it does taste better in warm weather! In a medium bowl, dissolve the coffee in the tablespoon of liquor. Add the sweetened condensed milk and stir together until combined. Set aside. In a large bowl, whip the heavy cream using a hand mixer until stiff peaks form, about 3 minutes. Using a rubber spatula, gently fold the whipped cream into the sweetened condensed milk mixture. Pour homogenous mix into a freezer safe container with a lid, and freeze for six hours or until firm. Remove ice cream from freezer and let sit out for five minutes before scooping and serving. Place egg whites, sugar, milk, vanilla, and salt into a mixing bowl and whisk together. Stir in flour and butter until fully incorporated and batter is smooth. Lightly spray a nonstick skillet with a small amount of cooking spray. Pour 2 1/2 tablespoons batter into the cold skillet and spread into a thin even layer. Place skillet over medium heat and cook for 4 to 5 minutes or until base has set. Flip and continue to cook for 1 to 2 minutes. Quickly lay sugar disc into a buttered muffin tin and press down with a lightly greased shot glass. Leave shot glass in the cone cup for 1-2 minutes, or until the cone cup takes its shape. Transfer to a wire rack to cool completely. Repeat until all batter has been used. Carefully store in an airtight container for up to three days. 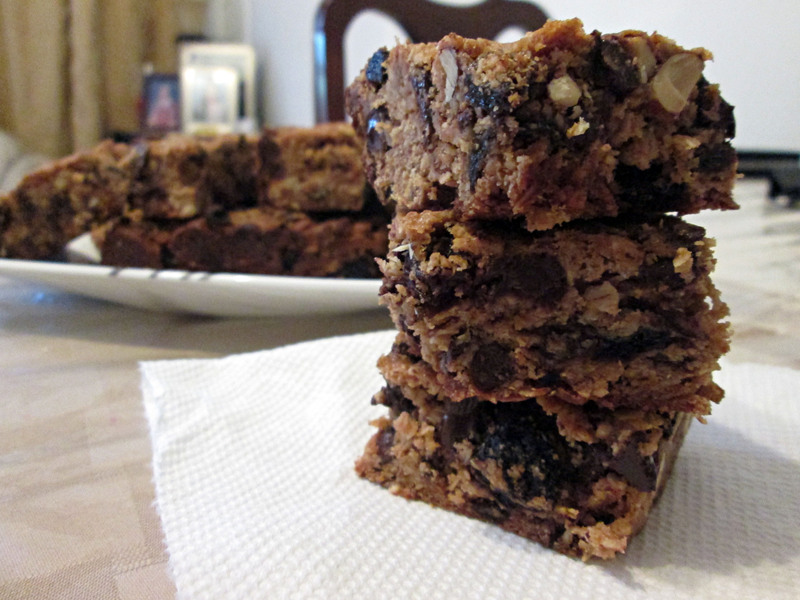 Granola bars, to me, are the perfect snack. Granted, I wouldn’t eat them alone as a snack but they go so well with a piece of fruit or alongside a sandwich for a quick lunch. When I started college, I made sure I always had something on me and granola bars were my go-to. I had my first energy cereal bar from the school store one day in class. I’ll never forget that because it was a bit of an experience. I sound like a crazy person even saying that I had an ~experience~ with a granola bar but entertain me for a minute. I never had one of those before, so I didn’t really know what to expect. I even remember the flavor; chocolate brownie. For comparison’s sake, I imagined that it was supposed to taste like a brownie so that’s what I used to figure out if it was tasty or not. I loved it. It had all my favorite things; chocolate, oats, and sugar so what’s not to love? I went back to my school store several times after that to try the rest of the flavors. I even looked up their website to see what else they had to offer and went on the hunt for all the flavors at different stores. Now, I don’t think I’ve met a bar I didn’t like because I think I’ve tried all of the different brands and kinds of bars out there. Every single one that I’d come across, I’d look for them in stores and try them. Honestly, I still do that. I love trying different things like that, just to see what all the hype is about. Anything from cereal bars, meal replacement bars, and even protein bars have gone across my lips. The best part about trying all these bars, aside from the variety, was their portability. I needed to have one in my bag at all times in order to stop any impending hunger signs on the spot, even after graduation. These days, I still carry some sort of bar in my bag; along with a giant bottle of water and maybe even an apple. I even buy my favorites in mass quantities so I have something to snack on while at work. However, since my folks are away and my stash is quickly depleting, I decided to make my own. Now, these were a long time coming. Even before I bought my last box of bars, I had been thinking about making my own. The only thing stopping me was that I couldn’t decide what to put in them! See, granola bars are a grab bag of stuff. Besides the required oats and nuts, it’s basically a free for all. I took what I had in my cupboard and went to town. These aren’t inherently healthy but I like to think that because they’re homemade, it cancels out. I tried my best to keep it sorta healthy but that factor is up to the eater to decide. I put all my favorites in here; oats (which are a given and required), raisins, cinnamon, chocolate chips, peanut butter, and nuts. I kind of cheated with the nuts because all I had were some nut clusters, which I chopped up and threw into the mix. Then I switched the butter for some melted coconut oil; one of the trendy fats that are really good for your body on the inside and outside. I also used agave; a sweeter and less viscous alternative to honey. And just for funsies, I used half brown and half white sugar. I wasn’t expecting these bars to be this delicious, in all honesty. Reminiscent of these things but baked and better! Mine got nice and toasty in the oven, which added some crunch and a touch of extra nuttiness. Swapping the butter for the coconut oil was genius too because there was just a slight coconut-y taste; it made me wish I had shredded coconut to add to it! 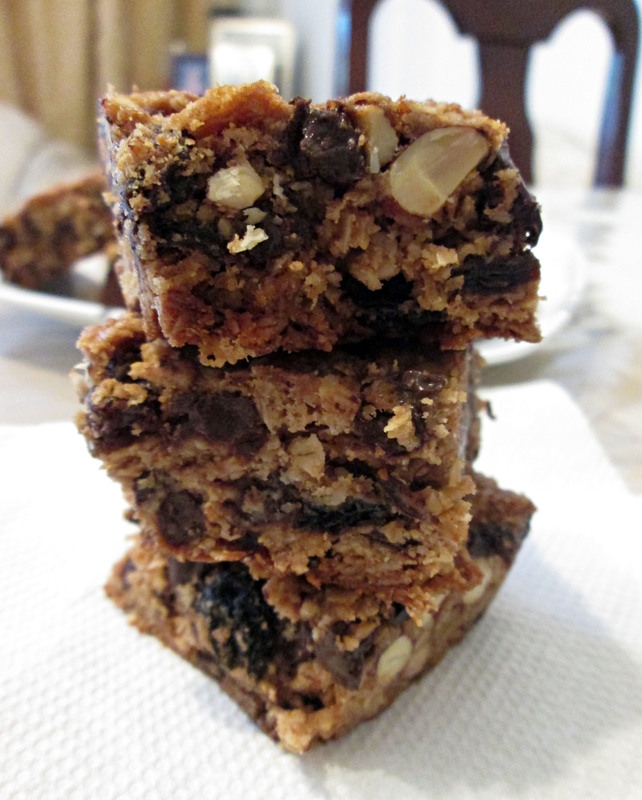 The raisins added some much needed fruitiness and chew, while the nuts added another element of crunch, and the chocolate chips just added chocolate. After trying the first bite, I couldn’t stop thinking about other flavors and mix ins I could shake up this recipe with! They are seriously one of the best homemade bars I’ve had (and made), and I can’t wait to take them everywhere with me. Preheat the oven to 350°F. Line an 8″ x 8″ x 2″ pan in one direction with parchment paper, allowing it to go up the opposing sides. Lightly grease the parchment paper and the exposed pan, or coat with a non-stick spray. Stir together all the dry ingredients, including the fruit and nuts. In a separate bowl, whisk together the peanut butter, vanilla, melted oil, liquid sweeteners, and water. 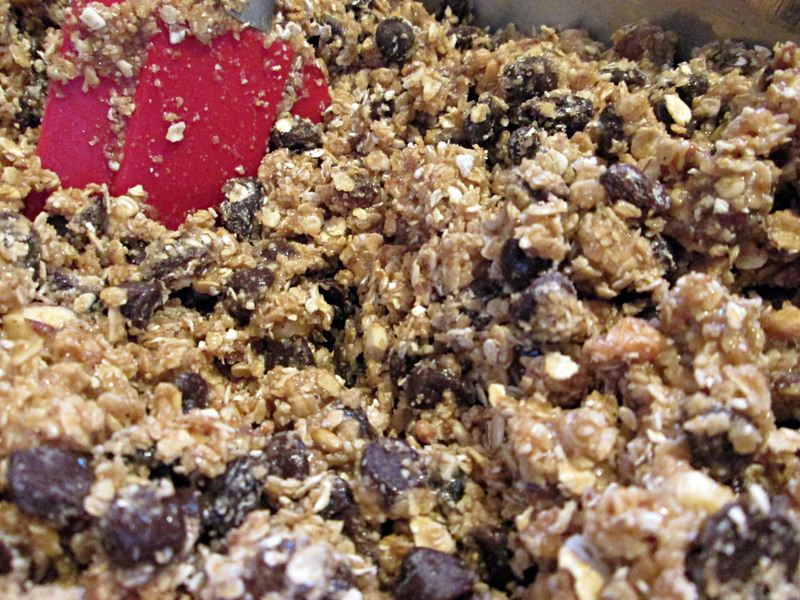 Toss the wet ingredients with the dry until the mixture is evenly moistened and crumbly. Spread in the prepared pan, pressing them in firmly to ensure they are molded to the shape of the pan. 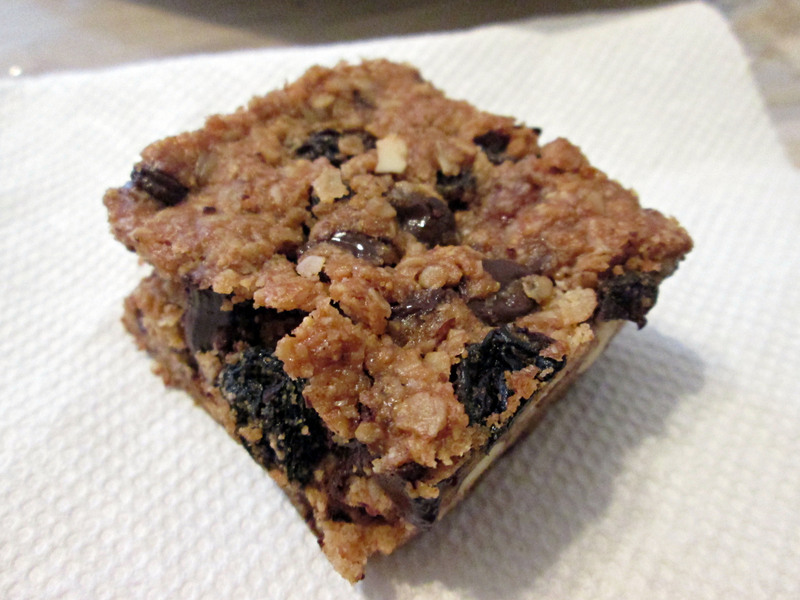 Bake the bars for 30 to 40 minutes, until they’re brown around the edges. Cool the bars in their pan completely on a cooling rack. Once cool, use a serrated knife, bench knife, or really sharp chef’s knife to cut the bars into squares or bars. To store, wrap the bars individually in plastic or stack them in an airtight container. Word to the wise, the bars get stiff in the fridge and may be hard to eat. If you have time, let them sit out for 10 minutes or so before eating. As evidenced by several posts on here, I am very much a traditionalist. I love celebrating holidays, more so when they celebrate the people I love. Father’s day was this Sunday, and I couldn’t really go without making anything. As a kid, I used to hand make cards for every occasion. Tons of construction paper, crayons, markers, glue, and glitter strewn everywhere as I created a card with a badly drawn picture and a heartfelt message. While I don’t make cards anymore (I should really get back into that, though), I still find a way to make something awesome with a ton of love inside it; just like my mami taught me. My dad is a really complicated guy. So much so, it’s hard to understand what he wants/means/says at any given time. We grew up with his naturally stern voice guiding us through life. He was very particular about how he wanted things done, and wasn’t afraid to let anyone know that. I ended up picking up this trait to a degree; something which I’m still not sure is a good or bad thing. We had a sort of strict upbringing that we now chalk up to my dad’s old age. Believe it or not, he’s from a different time (and I’m not just saying that). This is where another one of his traits, that I now possess, comes from; the aforementioned traditionalism. While his traditionalist ways have nothing in common with mine, it was evident that he liked things done the old fashioned way. He was more traditional in the sense of how my sister and I were raised, and wanted to do it like it was done ‘back in the day.’ There were certain things we could, couldn’t do, and still can’t do to this day because he still sees us as his little girls. Before I made my move from observant child to baking ‘adult,’ my dad was the resident baker. 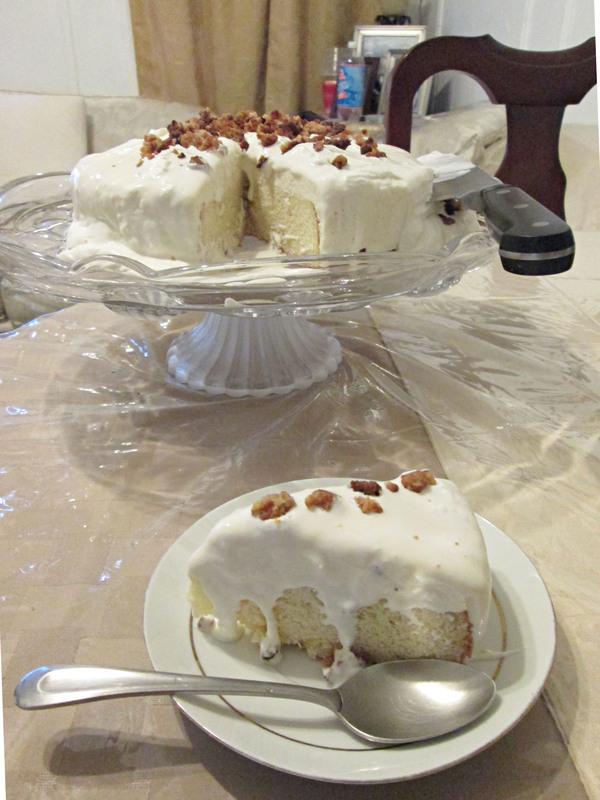 Granted, it was box mix cakes and canned biscuits but it was still delicious and what we thought of as an amazing feat. I even inherited the old avocado green Presto hand mixer he got in a garage sale when my sister and I were little. The mixer didn’t make it to this day (ahem, I might’ve killed it with some cookie dough) but I managed to get some use out of it. Now that I do all the baking, I take advantage of it and make things for special days in lieu of an actual gift. Sounds like a cop out but who doesn’t like baked goods? Two years ago for Father’s day, I made him an ice cream cake. It was a pound cake with rum raisin ice cream and a toasted coconut topping. It was my very first time making ice cream, which was a giant feat because I don’t have an ice cream machine. I used David Lebovitz’s delicious rum raisin recipe and one of his no churn methods; frequent whisking during the freezing process to break up large ice crystals. It was a lengthy and part laborous process but it was worth it. 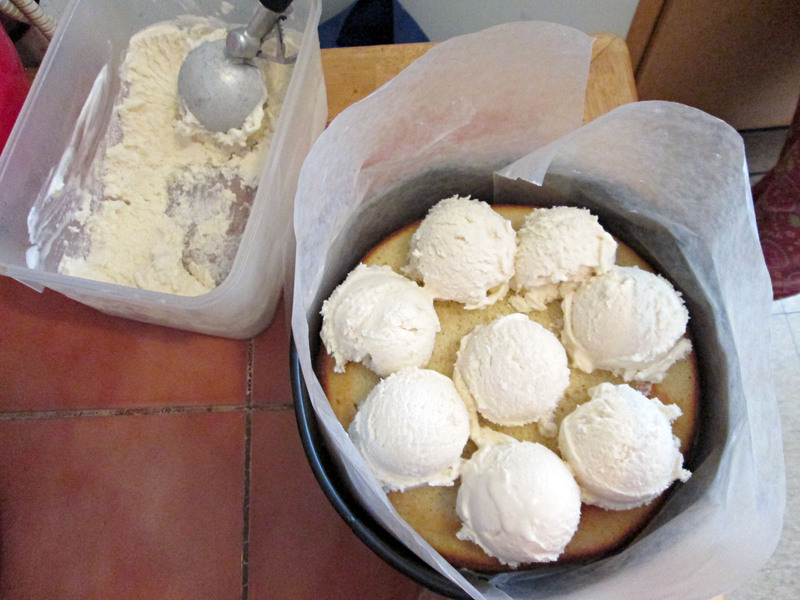 With it, I baked a pound cake to serve as the bottom layer of the ice cream cake. I didn’t freeze the cake long enough, and it ended up soaking up most of the ice cream layer. It was still amazingly delicious but it didn’t stay in two distinct layers. This year, I wanted to do it again. Ice cream is a show stopping dessert, more when there’s a cake attached. It’s even more glorious once people realize that you made it yourself, and that you did it without an ice cream maker. This time, I wanted something simpler. I originally wanted to repeat the rum raisin flavor but poor planning didn’t let me. Instead, I stuck with vanilla. I found out about this awesome way to make a no churn ice cream that was still soft and scoopable, without any noticeable ice crystals and a silky mouth feel. I was skeptical about the method, but it quickly gained my trust. There is no cooked custard in this recipe, which is great for anyone who finds that process daunting (it isn’t but the thought of maybe scrambling the eggs is stressful). It’s just three simple ingredients; sweetened condensed milk, heavy cream, and vanilla extract. I absolutely love this because not only is it easy, but it leaves a lot of room for customization; there’s no telling what other flavors this base can be made into. It took me two days to complete the cake. Not because of complicated instructions or anything, but because all the elements require freezing prior to assembly. I made the cake layer and ice cream Saturday morning. I popped the ice cream in the freezer, and hyper wrapped the cake and froze it after it cooled completely. This is where I messed up the last time I made an ice cream cake, so I made sure I left both elements in the freezer as long as possible. Sunday morning, I assembled the cake. First, I leveled out the cake a little bit. My oven is lopsided, resulting in asymmetrical cakes every time. I put the cake layer inside of a springform pan lined with wax paper. I’m paranoid about things staying stuck in places, so I put it in for security purposes. Next, I scooped on the ice cream. This is the part where I was amazed. The ice cream scooped beautifully! Even my mom was shocked, stating that it looked just like the store bought stuff! This is why I love baking; I always feel like a mad scientist when things work out. I smoothed down the ice cream into an even layer and hyper wrapped the entire pan in plastic wrap before returning it to the freezer. As for the cake scraps, I had an idea for those. Ice cream cakes always have some sort of crunchy element; be it candy pieces or crushed cookies. I took advantage of the fact that I’d have some cake scraps, so I crumbled it up, tossed it with some melted butter, and popped in the toaster oven until they were golden brown and toasty. Instead of putting it in the middle layer, I left it as garnish. I didn’t want them to get too soggy! The cake came out amazing! It started melting almost immediately, but it was really creamy and smooth. It tasted like the real ice cream! No one could tell it was homemade and made without a custard base. 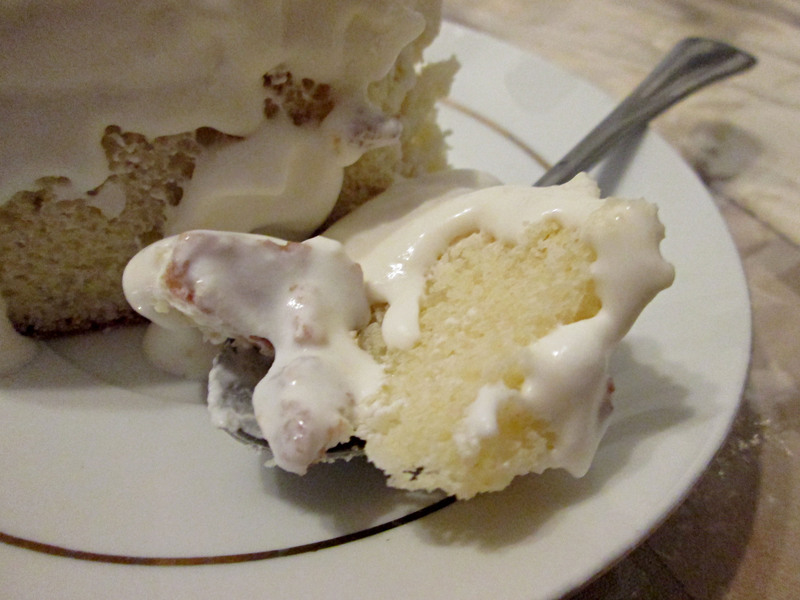 The cake was soft, dense, and went well with the vanilla ice cream. 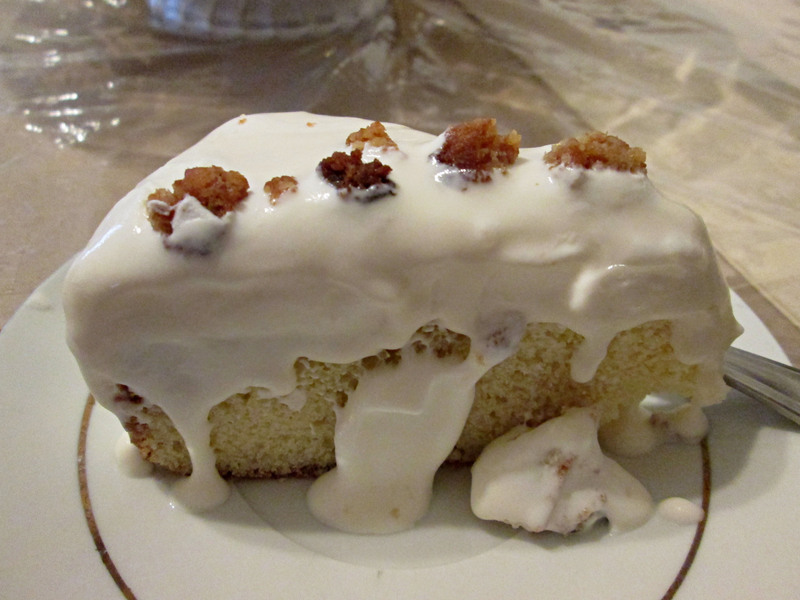 The cake crunchies were an excellent texture change, and added depth to the creamy ice cream. I also made some whipped cream in a jar. It totally does work! Took a while but it turned into luscious whipped cream in minutes. My dad liked the cake, which was more than I was hoping for. These days we don’t exactly see eye to eye, but I know that he just wants what’s best for me and my sister. I just hope that my kids will one day get to know him and understand why I am the way I am. In a medium sized bowl, combine the sweetened condensed milk, vanilla, and bourbon or rum (if using). Set aside. In a separate large bowl, whip the heavy cream to stiff peaks, about three minutes. Fold the cream into the sweetened condensed milk mix carefully. Pour into a loaf pan or plastic container with lid, and freeze for six hours or overnight. Preheat oven to 350F. Butter and flour a lined 9-inch round pan. In a medium bowl, sift together flours, baking powder, and salt. Set aside. In a large bowl, cream together the butter and sugar until creamy and pale, 3-4 minutes. Add eggs one at a time, and vanilla extract. With mixer on low, add the dry ingredients alternating with the milk; starting and ending with the dry. Beat until combined. Pour batter into the prepared pan, and bake in the preheated oven for 30-35 minutes until golden brown or a toothpick inserted in the center comes out clean. Transfer pan onto a wire rack to cool for 20 minutes. Invert cake, peel parchment, and continue to cool on the rack top side up. Cut a piece of wax paper a bit larger than a 9-inch springform pan. Place the wax paper over the bottom part of the pan, and hinge the circle over the paper. You want there to be a bit of overhang on the bottom for easy removal. Cut another piece of wax paper to line the sides of the pan. Again, make sure there’s a bit of overhang for easy removal. I used a long piece and cut it in half, lengthwise. Scoop ice cream onto the cake layer, and spread evenly. Smooth out the top, and cover with a piece of plastic wrap. Fold down the wax paper onto the plastic wrap. Cover the entire pan with plastic wrap, and freeze for at least four hours, or longer. To serve: unwrap the plastic wrap off the pan. Unhinge the springform, and remove the wax paper off the sides. Using the overhang from the bottom of the cake, lift the cake off of the bottom part of the pan. Carefully peel the paper off the cake, and place the cake on your desired plate. 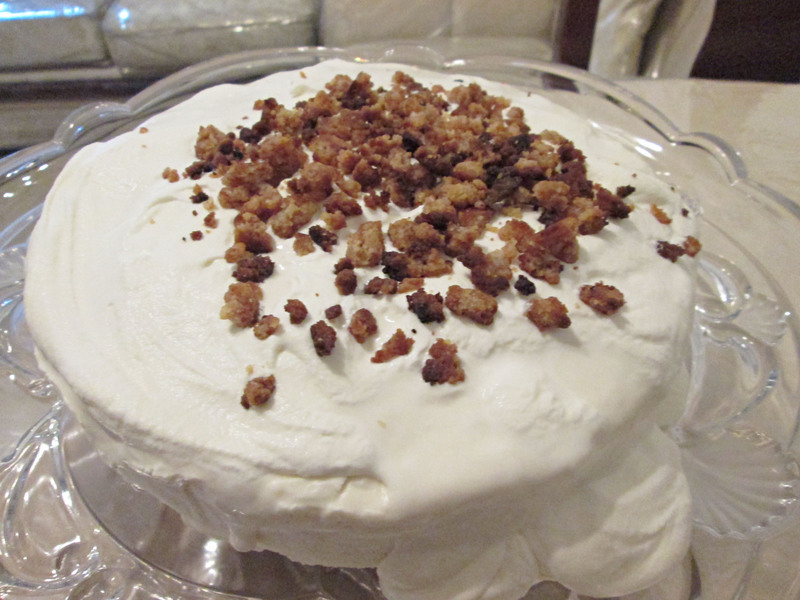 Top with whipped cream and cake crunchies, and serve. No churn ice cream is awesome but I don’t think it’s appropriate for a cake. It starts softening and melting pretty fast, which may not be ideal for a cake. Still good, though! To make whipped cream in a jar: place cream in a jar with some sugar (powdered or granulated) and some vanilla extract. Place the lid on it and shake vigorously! I’m not sure how long it took but I shook that jar for a while! You’ll know it’s done when you can no longer hear the sloshing cream. Whip the cream before taking the cake out of the freezer; it takes a bit of time and the cake will start melting fairly quickly. I happen to be somewhat of a people pleaser. I made chocolate chip cookies again recently, since they were such a hit with my folks. My dad actually asked me after the first batch was all gone when I’d make them again, so I did; except they were now a problem. My mom came to me, holding a cookie, asking me why I didn’t make them without chocolate chips. I almost cried out in shock and dismay at that suggestion. If I’m making chocolate chip cookies, they’re gonna have chocolate chips (or chunks, in that case). They’re not called chocolate chip cookies by chance, you know. I explained this to her, to which she responded with an eye roll and then left the room, with cookie in tow. I started thinking about it, and decided to appease her the next time I hit the kitchen. Making chocolate chip cookies sans chocolate chips sounds easy enough, right? I mean, why not just make the recipe and leave out the chocolate chips? No, as that is not how I roll. What she wanted, essentially, was a soft sugar cookie. I’m not exactly fond of soft sugar cookies, as they taste like sugar coated butter to me (which may or may not be a bad thing, depending on the day and who you ask). I also thought about making snickerdoodles, because of their hint of spice, but opted out of those for the same reason. The main difference between chocolate chip cookies and sugar cookies, besides the presence of chocolate chips, is that chocolate chip cookies require brown sugar. I wanted brown sugar cookies, and this was what I set out to make. I love to use brown sugar in any recipe where it won’t be too noticeable. There’s just a certain warmth and chewiness you can’t get from regular white sugar. Brown sugar’s identifying characteristic is its brown color, which comes from the addition of molasses during processing. It’s also the reason why it’s soft. I had been burning thorough my brown sugar recently, so I took matters into my own hands. Brown sugar is actually really easy to make at home. All you need is white sugar, and molasses. Add 1 tablespoon of molasses to each cup of white sugar; more if you like a darker brown sugar, and mix. It’s really that simple! I started mixing it with my hand mixer, but hardware like that isn’t really required. I ended up blending in the rest of the molasses with a fork, which works a lot better and requires less clean up. 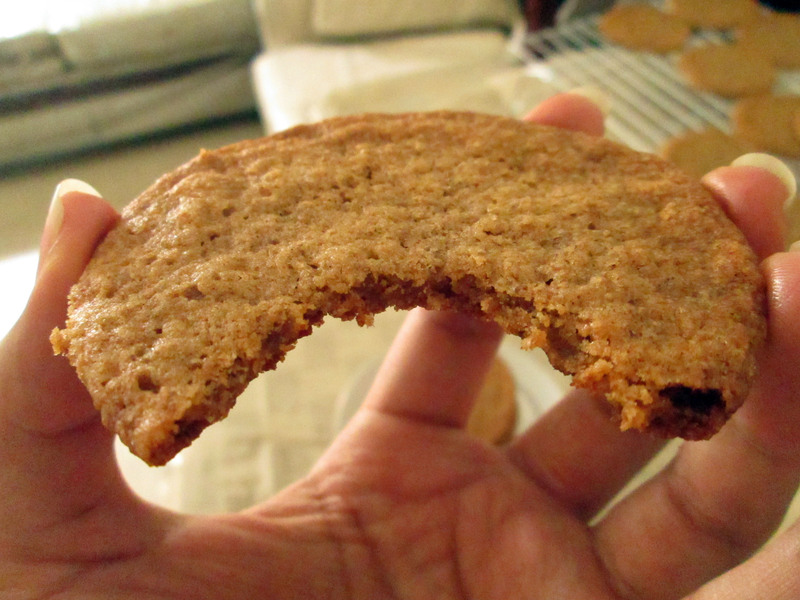 Homemade brown sugar is a bit darker by comparison to the store bought stuff, so do not be alarmed. Now, let’s talk storage. Brown sugar is moist by nature and it needs to stay that way. There are tons of stuff on the market to help keep your brown sugar soft, but I have an even easier one that doesn’t require a special purchase; a slice of bread! 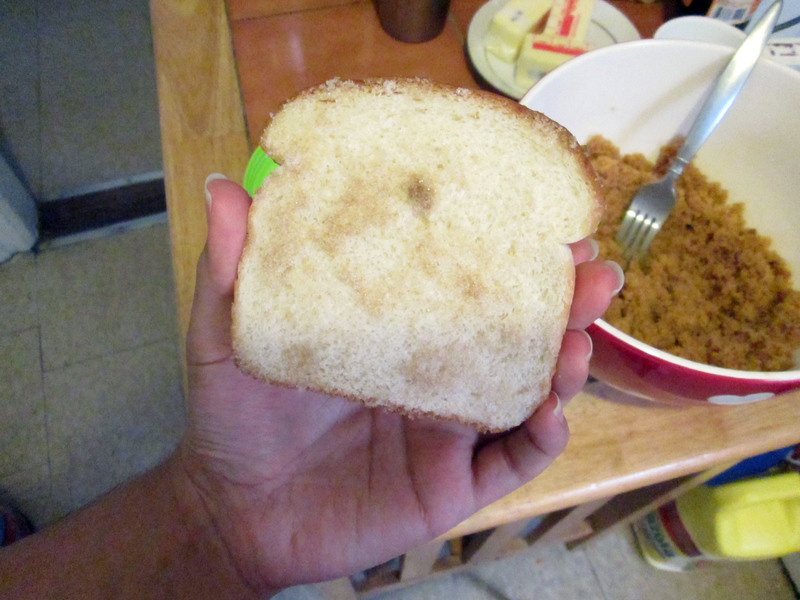 Just place your brown sugar in an airtight container with a slice of bread, and it’ll stay soft and moist for a couple weeks. Brown sugar is like the vampire of the baking world, as it feeds off the moisture in the slice of bread; sucking it all out in order to stay soft and sparkly. After a while, the slice of bread gets super stiff and kind of feels like a slice of toast. Replace the slice of bread periodically so the sugar won’t harden. If it does, cover the sugar with a damp paper towel and microwave in 30 second intervals until soft. Preheat oven to 350F, and place your oven racks un the center and upper third of the oven. Line two baking sheets with parchment and set aside. In a medium bowl whisk together the flours, baking soda, salt, cinnamon, and ginger. Set aside. Place butter and brown sugar in a medium sized bowl and using a hand (or stand) mixer, beat on medium speed until light and fluffy, about 3 to 5 minutes. Stop the mixer and scrape down the sides of the bowl. Add the egg and vanilla extract, and beat on medium speed for one minute more. Add the dry ingredients, all at once, to the butter and sugar mixture. Beat on low speed until the dough begins to come together and the flour disappears. Stop the mixer and finish incorporating the ingredients with a spatula. 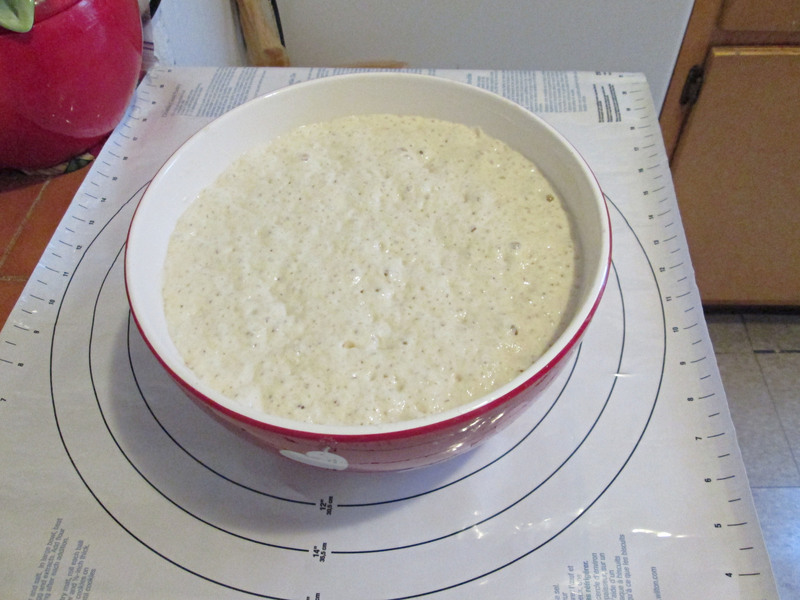 Once all the flour is thoroughly mixed in, cover the bowl with plastic wrap and refrigerate for 30 minutes. Using a cookie scoop or a tablespoon, dollop balls of dough onto the prepared baking sheets. Bake cookies for 10 to 12 minutes, or until lightly browned around the edges. Cool on the pan for 5 minutes, before transferring to a wire rack to cool completely. Cookies will last, in an airtight container at room temperature, for up to 5 days (if they last that long). Not in the mood to make brown sugar by hand? Use your food processor! Just add the sugar and molasses, and blend! Now that Halloween is over, we can all concentrate on the next holiday in the lineup: Thanksgiving. The following day after Halloween, I saw an onslaught of Christmas stuff everywhere. Ads are already popping up on TV, big toy books from Target and Toys R Us have landed at my door, and the seasonal aisle in my local drugstore is decked out in red, white, and green. Honestly, I’m not ready for this Christmas explosion! People are getting too ahead of themselves in preparing for the biggest shopping season of the year, but let’s concentrate on turkey day. I love the hype around Thanksgiving, even if it is a small amount. The hype I do hear, is all about the food and the preparations behind them. Planning a meal worthy of this holiday takes a lot of time; there’s invites, place settings, decorations, and of course, the menu. Most people start prepping and planning as early as possible, even as soon as the beginning of the month. One of the biggest items on the list what can be prepared in advanced and how far in advance can it be prepared. 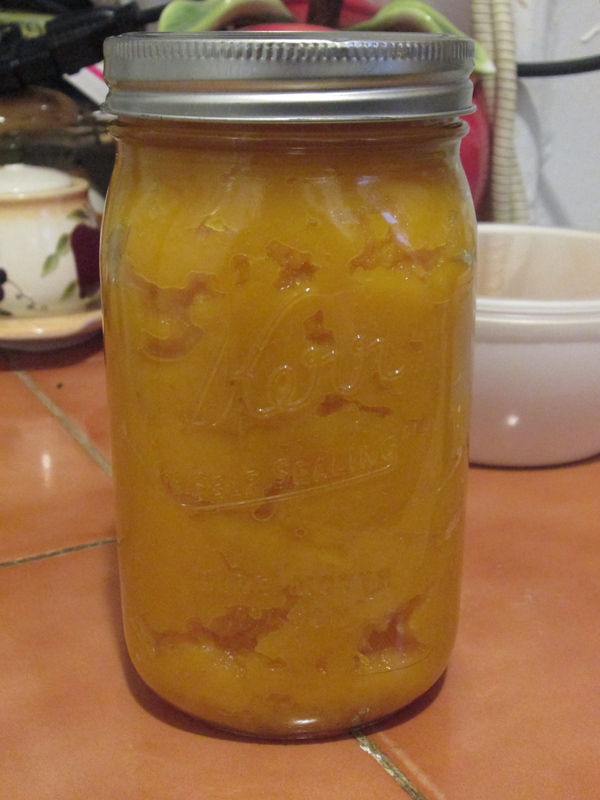 Instead of relying on a last minute purchase of canned pumpkin, why not make it yourself this year? Homemade pumpkin puree is a seriously easy process that can be done well in advanced, and can get you more bang for your buck. I used Ree’s (aka The Pioneer Woman) instructions as a guide. First, buy yourself a sugar pumpkin. I got my medium sized pumpkin at my local farmer’s market for $2. Make sure it is a sugar pumpkin and not a pumpkin used for carving or decoration! Now that the pumpkin has been acquired, it’s time to get to work. Preheat your oven at 350F. Line a baking sheet with parchment and set aside. Grab your cutting board and a large knife. If your pumpkin has a little dirt, you can wash it off but don’t worry too much about it because we’re going to peel it later anyway. Grab your knife and carefully slice the pumpkin into two halves. What I should’ve done here was cut the stem off, but I didn’t. You should cut the stem off first; it’ll make cutting it in two a lot easier. Now that your pumpkin is halved, use a large spoon to remove all the pumpkin guts and seeds. Save this stuff! We’re going to harvest the seeds to roast later. At this point, your pumpkin should be rid of it’s innards. 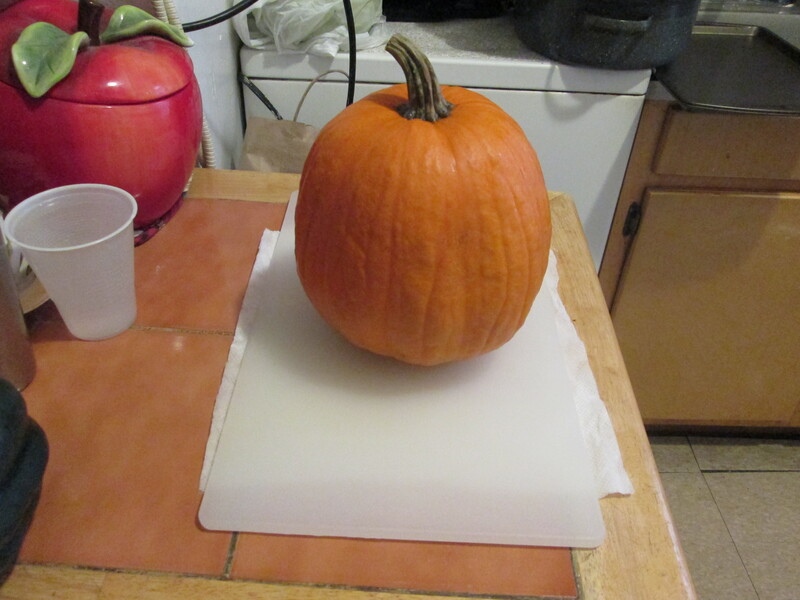 You can also cut the pumpkin into quarters for easier roasting (you may need another baking sheet, if you do). 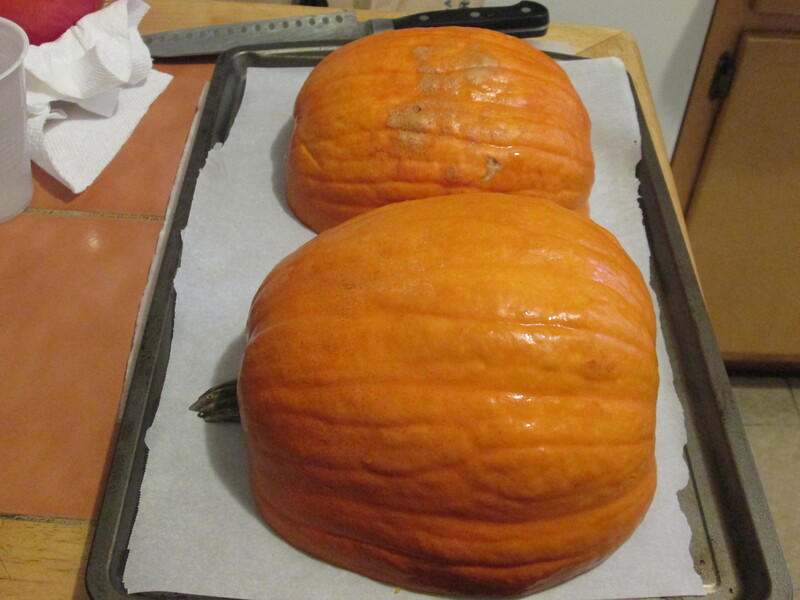 Put the pumpkin halves face down on the prepped sheet and bake in your preheated oven for 45 minutes to an hour. It’s done when a fork can easily slide into the pumpkin. 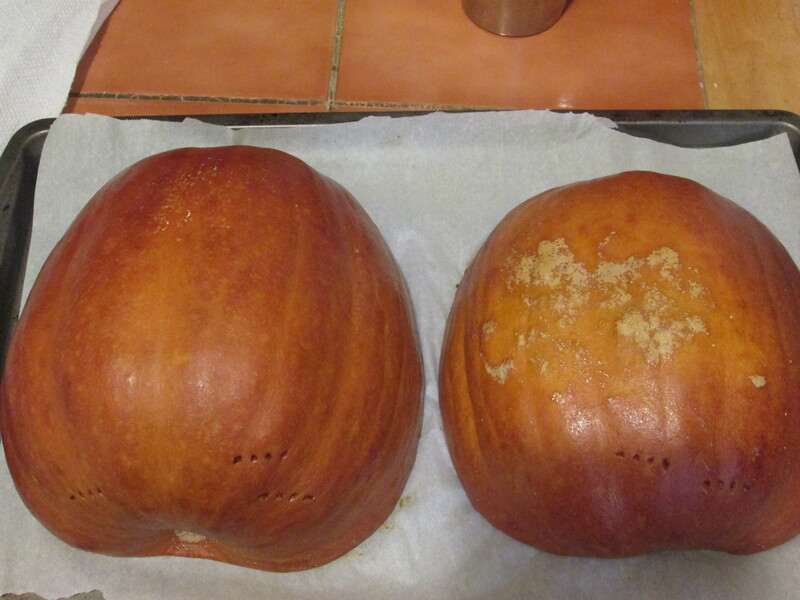 While the pumpkin’s baking, sift through the guts for all the seeds! This is slightly tedious but pepitas are awesome, so get your hands dirty! After getting all the seeds, give them a rinse. Gently dry them with a paper towel before drizzling in a bit of olive oil, some salt and pepper. Spread your seeds out on a parchment lined baking sheet and pop them in the oven. I’d say give them about 10-12 minutes, but please watch them so they don’t burn! Once cooled, you should have a lovely, and delicious snack! After checking your pumpkin for doneness (with the fork, remember? ), remove from the oven and let cool. While that’s cooling, let’s talk pumpkin pie spice. A lot of people serve pumpkin pie for Thanksgiving, deliciously so, and one of the main ingredients besides the pumpkin is it’s signature spice. This is the stuff that drives people nuts during the fall, mostly in those pumpkin spice latte things from coffee chains. What most don’t realize is that this signature spice mix is simply a combination of things you probably already have in your pantry! Instead of shelling out close to $8 for a tiny bottle, a quick Google search, led me to this recipe from Joy the Baker. Pumpkin pie spice is basically a mix of cinnamon, cloves, allspice, nutmeg, and ginger (and cardamom, if you got it). This is as easy as measuring out the spices, and mixing it in an empty spice jar. All you need is 1 tablespoon of ground cinnamon, 2 teaspoons ground ginger, 1/2 a teaspoon of each: ground cloves, ground allspice, and freshly grated nutmeg. Joy also adds a big pinch of cardamom (or mace), add it in if you have it. Pop all these in the empty spice jar and give it a healthy shake. Make sure all the spices are incorporated, and you’ve got pumpkin pie spice! So easy, and so affordable! Now that we have pumpkin pie spice and pepitas, let’s get back to the pumpkin. Grab your knife and cut your halves into quarters (if you haven’t already). 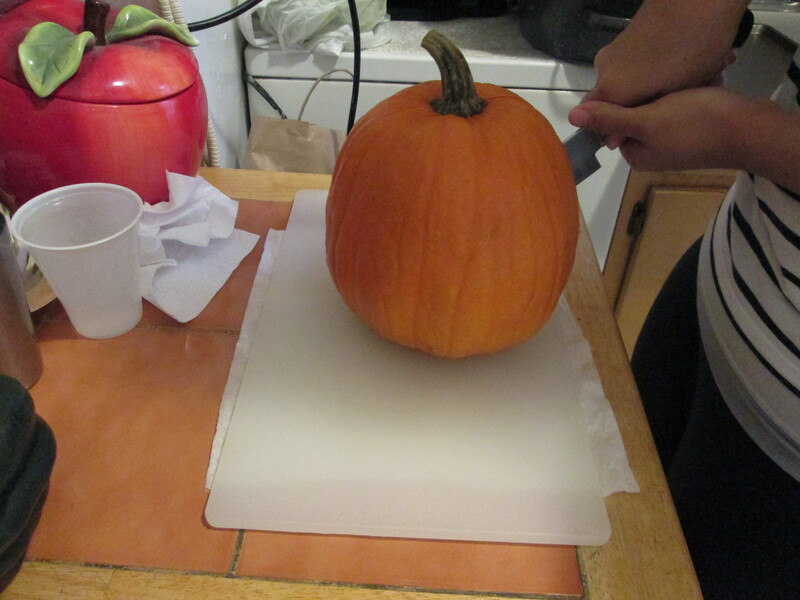 Gently slide the knife under the pumpkin’s soft and tender skin. Cut your peeled pumpkin into chunks, and discard the skins. And now, we puree. Place your chunks in the food processor and puree until the chunks resemble baby food. Periodically, scrape the sides down with a spatula. This may take several batches, depending on the size of your food processor. I have a mini prep, so mine took forever. When all of the chunks have been pureed, you’re done! Bask in the pumpkin-y glory you have now created! At this point, you can store it in jars, containers, tupperware, plastic bags, whatever you have that has a lid and can be frozen or refrigerated. This golden stuff should last a few weeks in the fridge, months if you freeze it. But we all know that if there’s pumpkin in the house, pumpkin things will be made! Just make sure to save some for your Thanksgiving pie! Blend all of the spices together, making sure to work through any lumps. Store in an old spice jar.